When 16-year-old Nick receives a package containing the mysterious computer game Erebos, he wonders if it will explain the behavior of his classmates, who have been secretive lately. Players of the game must obey strict rules: always play alone, never talk about the game, and never tell anyone your nickname. Curious, Nick joins the game and quickly becomes addicted. 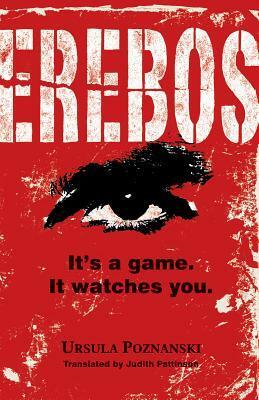 But Erebos knows a lot about the players and begins to manipulate their lives. When it sends Nick on a deadly assignment, he refuses and is banished from the game. Now unable to play, Nick turns to a friend for help in finding out who controls the game. The two set off on a dangerous mission in which the border between reality and the virtual world begins to blur. As a gamer the concept of a game that ask you carry out tasks in the real world is rather intriguing and was essentially the first thing that grabbed me about this book. It starts of fairly slowly as Nick attempts to get his hands on a mysterious package that is circulating through his school. When Nick manages to obtain one of these packages he discovers it is a computer game, Erebos. As Nick progresses through the game the lines between fantasy and reality begin to blur as the game asks him to perform simple but increasingly sinister tasks in the real world in order to advance in the game world. Nick is a typical teenage boy, who falls victim to his own curiosity, peer pressure and the desire to succeed. Like most teens he is stubborn and dismisses the concerns of those who care about him with out a second thought. This makes him a charcter who is easy to relate to. As the story progresses and things start getting more sinister it becomes slightly frustrating that the characters don't just turn the game off and walk away, but this is kind of understandable if you consider the way that someone who is addicted would behave, sometimes it really isn't that easy to just walk away. The author has portrayed the addiction to gaming very realistically. The only real issue I had with the book is the ending seemed to be very sudden, it just felt like it was rushed. Overall an exciting page turner that will appeal to anyone who enjoys MMOs.